Science fiction and fantasy readers are in a constant dialogue with their favorite stories. At conventions, workshops, and online, people geek out about their favorite books. But sometimes, authors get a little tired of the same old memes. Ten authors told io9 about the writing terms they'd like to see retired. Top image: Blue Mars by CarlosNCT. It stupidly tries to define expository writing as something necessary but mechanical and ugly, which is terribly inaccurate, as expository writing is often necessary, crucial, beautiful, and hard to categorize or even see; and also the term comes out of a workshop aesthetic that tries to reduce fiction to mechanical parts, and to denigrate fiction itself as part of a fearful attempt to assert mastery of it, most often used by people who don't really like fiction, even if they pretend they are trying to write it. He adds, "It's a term of contempt, used to abuse by fearful people. Definitely worth hating!" I genuinely wish that everyone would delete the word "Mary Sue" from their vocabulary. In its original, fanfic usage, it described a character who was, yes, usually female, but whose greatest crime was not perfection: it was twisting the story. A Mary Sue in that sense literally walks into someone else's world and makes everything about her. Flash forward to the modern day and it's a rare female protagonist who doesn't get accused of being a Mary Sue, and hence worthless. Here's the thing: she can't distort the story if the story already belongs to her. The protagonist, regardless of gender, is awesome and interesting and has a milkshake that brings all the boys, girls, or genderfluid space pirates to the yard, because that's why they're the star of the story. So calling female protagonists "Mary Sue" is sexist, belittling, and reduces them in a way that is very rarely applied to their male counterparts—even when those male counterparts are just as guilty of being a little too perfect to be real. Elizabeth Bear (The Steles of the Sky) adds that Mary Sue seems like "a term which had some useful specificity when it was coined, but has since become a broad-brush catchall used to dismiss any competent female character who acts like a protagonist." Eileen Gunn (Questionable Practices) says she'd like to see the word "dystopian" vanish from everybody's critical vocabulary, at least temporarily. "There's nothing wrong with it per se, but I'm bored with encountering over and over again in reviews, ornate but utilitarian, like a piece of mass-produced Victorian fretwork," she says. It's reached the point where it no longer really means anything, and you could always replace it with other terms. "Its absence would leave a few holes in my own critical writing this year, but I could just plug in a variety of morose adjectives, and speak of miserable societies, despondent universes, disconsolate futures, and, of course, terminally unhappy YA novels." People are obsessed with the "rule" of "one scene, one POV," says Ken Liu, author of the forthcoming The Grace of Kings. "This once-helpful maxim has turned into some kind of absolute rule and I'm sick of hearing about it," says Liu. "There are plenty of places where this 'rule' doesn't apply, and I wish people would stop throwing it around." He adds, "'Head-hopping' is the very point of fiction! And written fiction isn't film, so a lot of this objection to 'violation of POV' business is pure nonsense." This terminology, says Ashby, implies that science is something that only certain people can do, "rather than something anyone can do if given the right opportunity. We live in an era in which even the basic precepts of science are under attack," says Ashby. Politicians in Canada, where she lives, are trying to keep science out of debates over public policy issues. "Those aren't soft problems. They're wicked problems." And when you look at other genres, they have a far wider spectrum of descriptions for sub-genres. High fantasy. Low fantasy. Epic fantasy. Grimdark. Noir. Psycho-thriller. Psycho-sexual thriller. Gothic. Gaslight. Those are just a few. I would argue that the rich array of descriptors is one of the reasons fantasy and other genres outsell SF on a consistent basis. Those genres have a bunch of avenues to offer an audience. SF has only a binary system. What reader doesn't want more choice? Ted Chiang (The Life Cycle of Software Objects) says this maxim, when used to describe either SF or other fiction, gets on his nerves. This usually comes up after something happens that we'd consider implausible if we read it in a novel. But that's not because truth is stranger than fiction; it's because truth is judged by completely different standards than fiction is. When we read a work of fiction, we aren't comparing it to reality; we're comparing it to every other work of fiction we've ever encountered. A lone hero defeating an army of bad guys is a cliche in the movies, but if it happened in reality, people would be talking about it for a thousand years. This is why the phrase "based on a true story" is added to films that have scarcely any resemblance to actual events: it essentially removes the handicap that all fiction must compete under. James Frey's A Million Little Pieces was rejected 17 times when he submitted it as a novel, but became a bestseller after he submitted it as nonfiction. A run-of-the-mill piece of fiction becomes extraordinary if you think it's the truth. Images above from "The Merchant and the Alchemist's Gate" by Ted Chiang, art by Jacob McMurry for Subterranean Press. Tobias Buckell (Hurricane Fever) hates it when people dismiss a work of speculative fiction as "old hat," simply because it's been done at some point in the past. 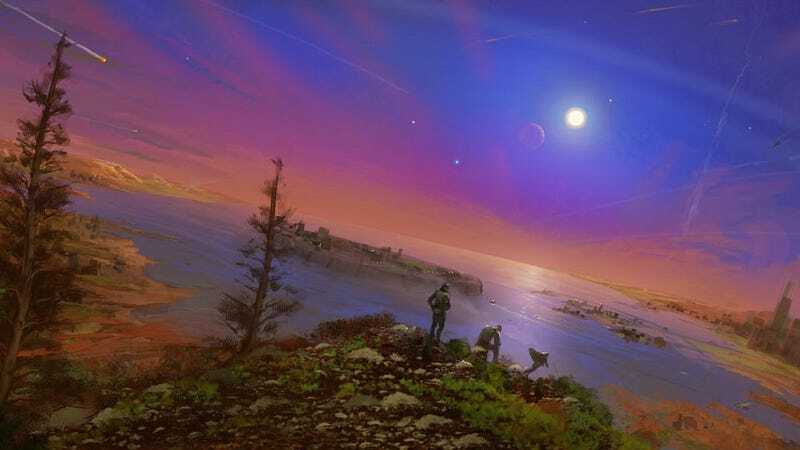 "I hate when I see books dismissed because the SF-nal concept isn't 'new enough,'" he says. "If you write about a generation ship right now, no matter how interesting the book, you'll get a certain number of people who would tune it out because 'it's an old concept being rehashed.' You see a lot of great books dismissed as 'Heinlein did that.'" An "idiot plot" is usually described as being one which only works because the characters are idiots — if they were competent or resourceful, the story would be over. "This is a term you mostly see in critique groups," says Nalo Hopkinson (Sister Mine). It's "very difficult for many emerging writers to hear anything after the word 'idiot.'" Ellen Kushner (The Privilege of the Sword) says she gets tired of hearing this term. "Characters are not supposed to be relatable. You're not supposed to feel lke they're your pal, or they're you," she says. "The characters are supposed to open you up and explode you. You're supposed to engage with your feelings about them which are not necessarily feelings of cuddliness." Adds Kushner, "You marry somebody relatable, you don't read about them." Fiction is supposed to expose you to different types of people, and new ways of thinking. Plus this whole notion of critiquing fiction based on whether characters are relatable is really "TV and movie talk."